In the small bowl, squash soup with cinnamon and almond paste by K. Very fine. You can ask her for the recipe. In the deep plate, orecchiette with goat cheese, clams, and garlic. Plus some broccoli because -- why not? The pasta dish was inspired by something crazy good I had last December at Pomelo in San Francisco: ~braised pork with savoy cabbage over orecchiette with gorgonzola. At some point I may type up the recipe as best as I could recreate it. 1. Put pasta on to boil. 2. Put broccoli on a steamer (and don't overcook like I did this batch). 3. 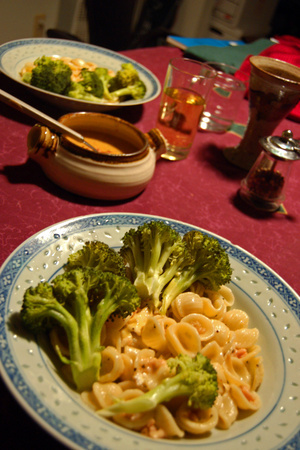 While the pasta and broccoli are cooking, start a skillet with olive oil and sliced garlic. 4. Drain pasta and add to the sauteed garlic. Enjoy the sizzly noises. 5. Add chunks of goat cheese (total size ~3/4-stick butter). Heat until it's mostly melted into a sauce. 6. Add a can of minced clams, partially drained (or not) and heat through. 7. Serve in deep dishes with salt, pepper, oregano, and grated romano. Consider adding some chili peppers. Pour a glass or tumbler of simple white wine for your drinking. And if you think this is really just a fancy plate of macaroni and cheese accompanied by broccoli and cheese sauce, who would call you a liar? Not me. Orecchiette is my favorite kind of pasta because it means "little ears," which is of course exactly what it looks like. That dish looks very yummy! Minty -- thanks for the comment and oh-so-polite spelling correction (I think I fixed all the errors in the original post). But does "linguine" look like "little tongues" to you? D'oh! OK. Not that most people would notice, but I had to correct the "orecchiete" AGAIN (thanks, Patty!). In truth, I looked up the spelling last night but then I typed it in wrong for all my "fixes". Anyway. Orecchiete. Orecchiete. Orecchiete. And a vote for Spanish as the Romance Language of choice. Sort of related: my 6th grade spelling book had a little column of anagrams including "colbroci" for "broccoli". I think I already know how to spell "broccoli" at the time, but I always hear the word "colbroci" in my head when I'm typing it. A word that always gets me: occured. I so badly want to put two "r"s in there. You know -- as in occurring and occurrence. Frickin' English. Oh wait. I just looked it up. It DOES have two "r"s. So am I thinking of some other trouble word like -- ARGH! (All of this is particularly annoying because I am actually a very good speller. Even though I got knocked out of the 8th grade district competition with my first word: "exept".